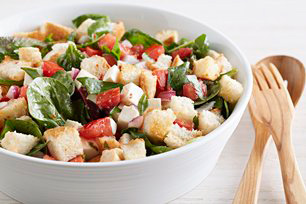 Cubed Italian bread, mozzarella, and classic bruschetta ingredients will make this 20-minute salad one of your new weeknight favourites. Toss bread cubes with 1/4 cup dressing; spread onto rimmed baking sheet. Bake 8 to 12 min. or until lightly toasted, stirring occasionally. Meanwhile, combine tomatoes, onions and remaining dressing in large bowl. Add salad greens, cheese and basil; toss lightly. Add toasted bread cubes just before serving; mix lightly. Stir 1/4 cup sliced black olives into tomato mixture before tossing with the salad greens, cheese and basil.